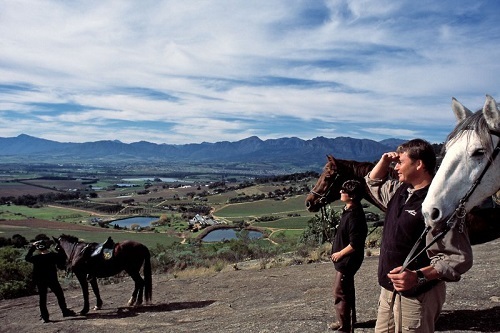 Explore one of the most scenic areas in the Cape Winelands, Franschhoek, on purebred Arabian Horses. Take a scenic drive from Cape Town and be taken away by breathtaking vistas and majestic mountain backdrops in a setting steeped in rich culture and history. Rolling vineyards and quaint Cape Dutch homesteads await you, as well as award-winning wine farms offering some of the world’s best wines. Visit a stable in Franschhoek and take a memorable 2 to 3 hour horse ride that takes you through magnificent vineyards to visit 2 of South Africa’s best Wine farms. Get to spend at least 30 – 45 minutes at each estate with the opportunity to participate in a wine tasting at each of the vineyards. Franschhoek (French corner) is one of the oldest towns in South Africa and has a strong French history and influence as this is where the French Huguenot refugees settled in 1688. Many of the refugees chose to name their farms after the regions in France from which they came. La Motte, La Dauphine, Champagne, La Cotte, Cabrière, La Provence, Bourgogne and La Terra de Luc are examples of original Huguenot wine farms which today not only retain their original classic Cape Dutch architecture but have also grown to produce some of the world’s best wines. The town’s close proximity to Cape Town (45 minutes), ideal weather, architectural beauty, huge variety of culinary offerings and award winning wines make it one of the most popular tourist destinations in the Cape Winelands. Many describe Franschhoek as the “food and wine capital” of South Africa. Get to take a walk in the town centre and experience its cozy coffee shops, sociable restaurants, art galleries, craft and antique shops while also visiting the Huguenot Monument which stands at the end of the town. Walking tour of Franschhoek city centre.